No other magician has given so much prominence to digitization in his stage act as Simon Pierro. With a mind-boggling blend of magic and technology, innovation and illusion, the likeable German has fascinated millions with his particular brand of wizardry. His journey to stardom began after he was royally ripped off during a trip to New York as a teenager. New York, summer 1993. The sun beat down mercilessly, wringing the sweat out of the crowds of people on the streets. Seen from the Rockefeller Center observation platform, they moved like viscous lava through the streets between the skyscrapers. The air stood still. The only things moving quickly that day were the hands of the shell gamers on the street corners. A 15-year-old from Waldbronn in Germany was in the Big Apple on vacation with his family. With rapt attention, he watched the tumblers like a hawk. Finally, when the player lined them up in a row, he confidently placed his bet on the one to the right. Tough! The little ball was under the one on the left. Another try. More bad luck. The third and fourth time were no different. And that’s when he decided to give up. Twenty dollars of his holiday pocket money (‘a small fortune back then’, he grimaces) is what it cost him to realize that not even the sharpest eye could keep up with a conjurer’s sleight of hand. If only he had that sort of skill. For his birthday, he asked his sister to give him a book about magic and card tricks. ‘To ease the strain on my limited resources, I made sure I got it as a gift,’ he recalls, grinning archly. From then on, he hardly put the book down. And even then, only to practise the tricks like a man obsessed. The boy was Simon Pierro, and from that point on he was driven by the desire to become a magician. It didn’t take long for the sorcerer’s apprentice to become a veritable master, with fingers faster than any human eye. He baffled the captive audience he had in his family but was no less bewildering for more critical friends and acquaintances. For his performances, he adeptly wove his tricks into stories. ‘Later on, while I was studying, and without the pressure to be a professional magician, I experimented an awful lot.’ It was hard work, but it brought him his first success. With a modern, fast-moving stage show, ‘The American Dream – From Dishwasher to Millionaire’, he provided a slick and much-admired contrast to the classic cliché of the magician in tailcoat and top hat. In 2002, his innovative interpretation of this fascinating art brought him the Magician of the Year award from Germany’s Magic Circle. He went on to take the German championship and was runner-up in the world championship of the Fédération Internationale des Sociétés Magiques. A further accolade came in the form of the Siegfried & Roy Award, which was presented to him in Las Vegas in 2004. Parallel to all this, he laid the cornerstone for a ‘serious career’ and graduated as an industrial engineer at the University of Karlsruhe, specializing in information technology. He skilfully combined his love of magic with outstanding technical expertise. He used projections on screens and canvases. And, in the process, created a furore. But it was a secret tip that gave him his entry into the Champions’ League of magicians. Veteran television presenter Frank Elstner invited him onto his ‘People of the Week’ show, where he was spotted by the producers of Saturday evening’s prime-time ‘Candid Camera’. Young, dynamic, fresh, charming and natural: exactly what they’d wished for in a magical decoy for their gags with the hidden camera. He seized the opportunity with both hands and went on to bewilder clueless passers-by in over 20 episodes with his magic tricks. He had the tact and sensitivity to create comic situations spontaneously without embarrass­ing his ‘victims’. He was highly professional, eloquent and telegenic. So much so that Germany’s best-known TV channels were happy to feature him time and time again. Behind the scenes, Simon Pierro was much in demand as a consult­ant. Among other things, he devel­oped an illusion for Heidi Klum’s ‘Germany’s Next Top Model’. Offstage, digitization was making rapid inroads into our lives and for many more traditional magicians was a source of increasing concern. With the advent and popularization of YouTube, HD cameras, iPhones and iPads, they feared they were doomed. In a sense, conventional conjurers had taken their place on the WWF list of threatened species. The underlying tone from members of the metier was distinctly sombre. And no wonder. The rabbits they pulled out of hats were showing signs of age and their white doves increasingly reluctant to fly as Simon Pierro reinvented the profession and created his own art form with iPad-based magic. A sober appraisal of the changed circumstances led him to the decision to engineer a paradigm shift. ‘Ten years ago, when I talked to colleagues, it was clear they’d made up their minds: YouTube was terrible! They were giving away the secrets of all our tricks. High-resolution cameras made it possible to analyse any magic trick frame by frame and see exactly how it was done. iPhones and iPads distract the public because they stare at the screen instead of concentrating on the stage. I thought to myself I can’t make the internet disappear. So, I decided to do something with the iPad. In the first week alone, my very first video got three million hits. Thanks to HD cameras, I can perform in stadiums with tens of thousands of spectators because the pin-sharp resolution makes even close-up effects possible with large audiences. The iPad has become my trademark. 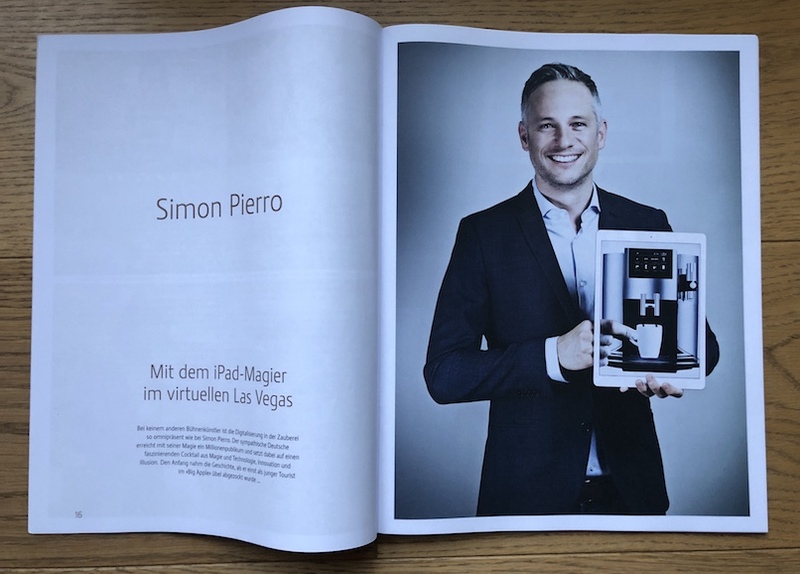 I suppose I was lucky to try out something new early enough and to use the opportunity I had for change.’ For Pierro, YouTube turned out to be the ideal digital platform – ‘my virtual Las Vegas’, as he affectionately calls it – where he now regularly attracts more than 100 million viewers. Talking of his audience: Simon Pierro does not restrict himself to enchanting members of his own species. The bewildered reactions of dogs and chimpanzees when titbits, peanuts or bananas suddenly disappear from his iPad only to be conjured forth as if by an invisible hand is currently the big hit on his YouTube channel. ‘People love animal movies. So, what could have been more obvious than to take my magic into the “bemused animal” dimension?’ But something that brings a smile to the face of the onlooker is also recognized by others as a sign of the master illusionist’s skill and innovation. And as he so clearly demonstrates, a genuinely good idea has no need of a gigantic stage or spectacular pyrotechnics as a form of distraction. His magic works because it is simple, small-scale and masterful in the execution. 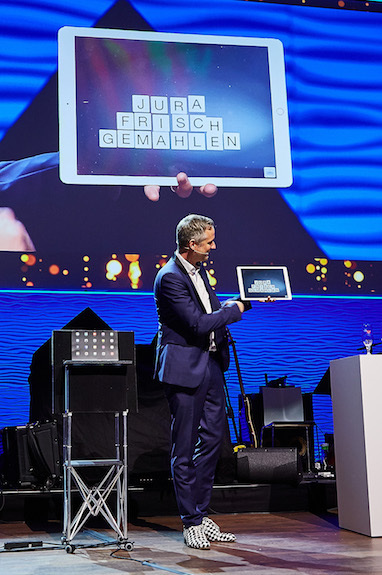 Now a resident of Munich, he is a perfect example of how people – or companies – can successfully adapt to new challenges. He is living proof that modern technology does not necessarily overhaul us or make us obsolete. You only have to know how to use them to your advantage. ‘Digitization has taken over almost every part of our lives, and in many areas new technologies are changing the world faster than people can change. We are confronted with the challenge of reinventing our self and coming to terms with disruptive technologies.’ This is the message he purveys not only as a magician but also as a public speaker. His voice carries a lot of weight at corporate events and symposiums because he has the subtle knack of finding an ideal mix between content and form, presenting his success story in a beguiling cross-over composed of magic and technology, innovation and illusion.